The Danish Midsommer celebrations are a highlight in the summer season. This ancient celebration of the summer solstice is as old as homo sapiens. In Denmark it's called Saint Hans Evening and it takes place on the 23rd of June each year. But remove the recent religious hijacking and it's still just a pure celebration of nature and of summer. 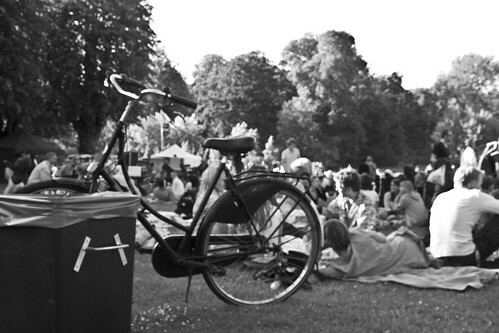 These two Copenhageners are heading for Frederiksberg Gardens for the midsommer festivities. Traditionally, Danes light bonfires at around 22:00 and burn an effigy of a witch - more recent religious hijacking of ancient traditions - but the important thing is that all across the nation people gather together on beaches and in parks to enjoy a lovely evening. 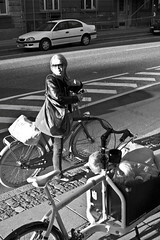 Often dressed in style and arriving on bicycle, as the above photo attests. Here's the family heading home in the late evening light. The kids are trashed at this point but there's no place like a Bullitt to ride home in. 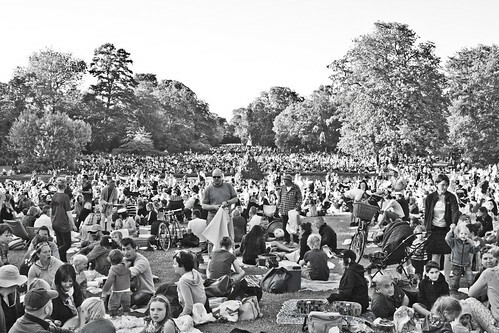 In Frederiksberg Gardens, in the heart of Copenhagen, around 60,000 people gathered to picnic, sing traditional songs, hear speeches and then watch the bonfire. It's an amazing experience. I'll admit that we left a bit early because of the kids and many people show up just in time for the bonfire. 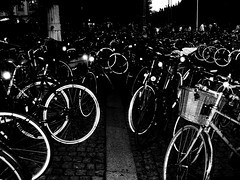 Friends who stayed later reported that the number of bicycles parked out at the main entrance was like nothing they'd ever seen before. 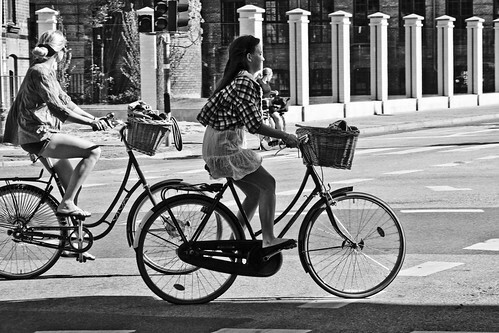 And these are Copenhageners. The weather was hot and lovely, so that encouraged more people to get out an enjoy it. Here's the bikes from last year, same place. May give you an idea. I'll bet that more than half of the 60,000 people came by bike, if not more. And that's just here. Then there's all the other midsommer celebrations around the city. Incidentally, tradition dictates that girls must pick flowers on this day and place them under their pillows. Then they'll dream of their future husband. And you fancy bettering your odds for good health, you may want to lick the dew off the grass this day. It'll help. Honest. I love summer in Copenhagen. that is pretty awesome!! summer here in SF has counted 'sunny' days but Im more of a fog-worshiper anywyas. We have tremendous fall gorgeous days, typically. This blog has great photography and this is the first blog with a black background that looks good! I'm just looking at this now. Busy with our own "Fête nationale du Québec" which was also "La Saint-Jean". Also a lot of religious (Catholic) trappings in the bad old priest-ridden days, and a strong nationalist history, but for most people nowadays it has become the same kind of holiday as your Midsommer - though to have evenings as long we'd have to head up to James Bay, which does NOT have the same climate as Copenhagen. The true Summer Solstice day (21 June) has become National Aboriginal Peoples' Day, celebrating indigenous people (Amerindians and Inuit). Summer Solstice went almost uncommented on around here, unnoticed by Texans. Your celebration there reminds me of the Alaska summer nights, we'd go to a movie, and when we came out the evening would be a bit dimmer but otherwise unchanged. we'd walk back home, stay up all night many times. Makes me a bit nostalgic! First picture, left corner: woven skirt guard. So cool! It's little details like this that make me fall in love with cycling over and over. 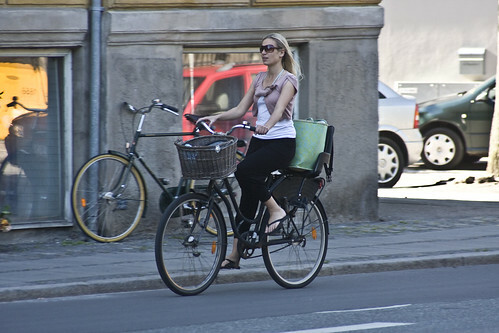 Jeg har fulgt med på CPH Cycle Chic som en "usynlig" læser længe, men nu må jeg altså kommentere for en gangs skyld! Nemlig for at komplimentere dette fantastiske indlæg om Sct. Hans. Det matcher den forelskelse jeg render rundt med for tiden. Jeg er så forelsket i den københavnske sommer! Wauw. Dette indlæg satte en stor fed streg under denne forelskelse. Tak. og katrine... tusind tak for dine fine ord. de gør mig glad!